Today I took a trip down memory lane or more specifically down the by-lanes of Bandra – those galis – a labyrinth of little streets, exploring the past, on a bicycle, then on a motorbike, and somewhere beyond Bandra, in a time confined to the realm of the present generations’ imagination, I even took a ship. The journey was an enthralling one – encountering moments of sheer hilarity, passion, love and even death. 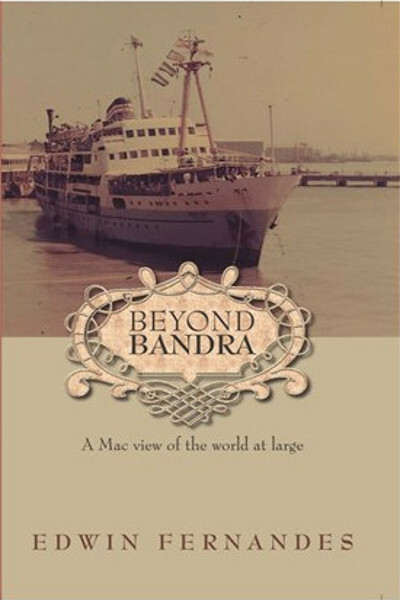 It was an invigorating experience to say the least and it was spurred by Edwin Fernandes’ latest book – Beyond Bandra (Goa 1556, 2018). This book is an anecdotal compilation of Edwin’s vast collection of three hundred blogs, showcasing the vicissitudes of life. The cherry-picked stories document his variegated experiences and are woven by a common theme – life and its phases – youth, adolescence, adulthood etc. But despite Edwin being the central figure throughout the narrative, making much of the experiences mentioned entirely unique and exclusive to him alone, the reader is not overcome with a sense of isolation. Instead, it evokes a feeling so familiar, almost déjà vu, as if you already experienced it. And for all purposes, it could well be true. For everyone at some stage can recount and reminisce about the time they received their first bicycle – the whirlwind of electrifying emotions that engulf the body and the longstanding desire and craving, almost pining to own something so powerful – a vehicle (literally and figuratively) to make ones journey. Edwin recalls his own experience, taking us along with him as he yearns to possess his own bicycle. It’s his own experience and yet you can almost feel the sense of urgency along with him, waiting patiently for the events to unfurl, longing to know if at all his dad would present him with his most cherished desire. And as you patiently wait with Edwin, you are immediately thrown back to your own childhood experiences and the time you wished for something. You recount that feeling, a hunger so to say that rips through your body, enough to overcome the trepidation of approaching your parents, wondering if they would heed to your request. This is what is so unique and special about this book – ‘you’ become the hidden character – hiding in obscurity, determined not to take the limelight away from the author. And yet, much of Edwin’s experiences soon become your own. His past, is your past, your story, your journey. One of the most fascinating aspects about this book is that you can start with any story – cherry-pick what you wish to read, whichever one describes and relates closely to you. Where his story ends, yours continues. The story goes Beyond Bandra and beyond Edwin’s own experiences and extends to you – the reader, the obscure and rather concealed character that lives to read the tale. Edwin’s mastery with his pen and artistic ability to illustrate each event, painting a vivid picture for the reader makes for an absolute riveting read. His words flow so easily, much as the stories do and it is not hard to understand why; especially when you chance upon a reference to some of Edwin’s favourite characters from some of his most treasured books and movies who step out of there histrionic role, making their cameo appearance ever so present. This book does more than just deliver and portray life – it is a multidimensional, multifaceted book that exhilarates almost all the senses – giving you a taste of good literature, music, movies and of course Edwin’s skill with words. So to you dear readers, the ones who have forgotten their childhood, the ones who enjoyed the Bandra fair but have now ‘grown out of it’, live a little. Wake up from your comatose state, relive and live the moments of drama, melancholy, joy and laugh as you journey with Edwin in Beyond Bandra. The banner image is of Mount Mary Church Bandra courtesy of Wikipedia Commons by Marshmir. Brian Lobo is the Executive Vice President of Edelweiss Securities, Mumbai. He is the former Managing Committee member of the Willingdon Catholic Gymkhana, Santacruz, Mumbai.